It’s now widely expected that the Federal Reserve will embark on another round of quantitative easing — this will be casually called QE3. The Fed has already taken other actions over the last 4 years to try to bolster the economy. From 2008 through 2011, the Federal Reserve embarked on a series of financial market operations to try to rejuvenate an economy grasping for air. Massive amounts of reserves were injected into the commercial banking system. 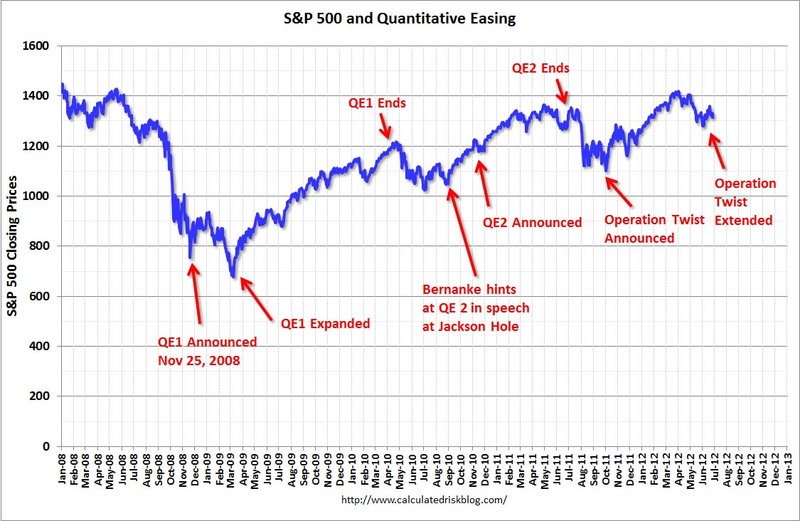 These policies, known as Quantitative Easing (QE) I, and II, and Operation Twist (a term from a similar policy enacted in 1961) consisted of purchasing hundreds of billions of dollars worth of mortgage-backed securities and treasuries from major federal agencies like Fannie Mae and Freddie Mac and other financial intermediaries. Unlike QE I and II, Operation Twist involved re-shuffling the Fed’s balance sheet by which short-term treasuries were sold in exchange for assets with greater maturities, such as mortgage-backed securities. These assets were bought in order to lower medium to longer-run interest rates, the only existing yields not near zero. By purchasing the toxic assets that so many financial firms were caught holding when the music stopped on the great credit expansion of 2003 through 2007, the Fed’s balance sheet and bank reserves expanded to historically unprecedented levels. From 1984 through 2008, the average amount of commercial bank reserves held with the Fed was approximately $20 billion. By the end of 2011, that amount skyrocketed to $1.53 trillion. Even though commercial banks are required to keep a portion of reserves on site with the Fed, almost all of these new injections of liquidity were excess reserves allowed to be loaned out at will. Calculated Risk has a succinct QE Timeline in this post. He also puts those dates into this graph of the S&P 500. It speaks for itself.